Solomon Brandt is a man of mystery, even to himself. Is he the wicked Civil War plantation owner whose cruel streak once knew no bounds? Or, instead, could he be a tenderhearted gentleman reborn in the modern age? His name is hated by the locals of Savannah, GA, and especially the descendants of the slaves tortured long ago by someone bearing the same name. The ‘new’ Solomon has no recollection of his past, except haunting nightmares that tell him more than he cares to know, and often more than he can bear. The journey to find himself leads through the heart of Savannah and it’s storied history. Solomon is drawn to an ancient, and haunted, plantation home that bears his name, as well as to a Hoodoo practitioner who converses with spirits, and her gorgeous green-eyed niece to whom he quickly develops a budding desire for. 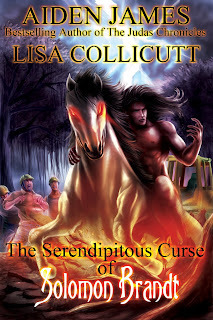 Curses run deep, as good and evil continue the age-old battle for supremacy. Immersed in wickedness long ago, Solomon has been given a second chance to set things right. A chance to live the life he once took for granted, and a chance to save the heart of the women he cherishes most. And, if he’s lucky enough, he might save his very soul.